A Twisted Christmas Carol is not the heartwarming tale of redemption that stirs generosity and inspires goodwill toward mankind that we have come to love about Charles Dickens’ holiday classic. It’s a madcap improv parody that takes the story from the perspective of Dickens himself. The start of the show is delayed by an impromptu interruption by Mr. Dickens (Kirk Smith) with a faux attempt to send the audience home because of his objections to turning his novel into a theatre piece. Thankfully, Dickens relents and sticks around to navigate the audience through the performance. 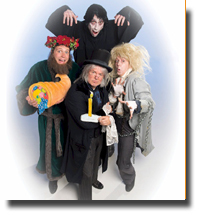 The show still centres on the egregious Ebenezer Scrooge’s encounter with the spirit of Jacob Marley, and the ghosts of Christmas Past, Christmas Present and Christmas Yet-to-Come. However, that’s all you get in common with the original Christmas Carol. The show relies on audience participation (with limits). Members of the audience are encouraged to offer up suggestions that wildly alter the anecdotal elements: Scrooge’s profession is changed from book-keeper to gymnast and Tiny Tim’s affliction is attention deficit disorder (ADD) rather than rickets – go figure? A cast of five actors, who portray roughly a dozen characters (only Gary Jones as Scrooge has a dedicated role), satirize, deride and lampoon the source material, along with commentary on our societal ills. To their collective credit, they nail the comedic timing throughout the show. Diana Frances is outstanding in a variety of roles, but principally Mrs. Cratchit. She also manages to confuse the audience as the front of house manager in the initial banter with the Charles Dickens character. Gary Jones is hilarious as the curmudgeonly Scrooge, Jeff Gladstone is delightfully over-the-top as the absurdly happy Tiny Tim, Bill Pozzobon is positively Pyhonesque as Mr. Cratchit, and Kirk Smith is appropriately pompous as Charles Dickens. Just when I thought I had seen every possible variation of Dickens’ A Christmas Carol (I even recall seeing a Muppet version), along comes this “Twisted” adaptation. If you’re big on improv, you’ll probably enjoy this show – you don’t need to be big on Christmas – or even Dickens. And you will see a different performance ecah night.